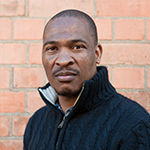 Phumulani joined the department in April 2014 as a technical assistant. Prior to this time worked in the museum’s Technical Department. Phumulani manages environmental conditions in the storerooms, provides support on fieldwork projects and with the curation of artefacts, and is involved in outreach exercises. He is currently doing second year in a BA degree at the University of South Africa, majoring in anthropology and archaeology.